Divide, CO May 14, 2016 - Midland Days at Divide, along with its co-sponsors, the Teller Historic and Environmental Coalition (T.H.E. Coalition) and the Divide Chamber of Commerce, proudly announces the 7th annual Midland Days symposium to be held at the historic John Wesley Ranch south of Divide on Saturday, May 14, 2016, from 9:00 am to 4:00 pm. Seating for the symposium will be extremely limited, as always. Advanced reservations, at $50 per person, are strongly encouraged. Reservations should be made by calling David Martinek at 719-213-9335 or emailing him at MidlandDays@yahoo.com. Refreshments will be served throughout the day, as well as lunch. Walk-in attendees are welcome on event day for $55.00 per person, but seating and lunch cannot be guaranteed (i.e., standing room only). According to the tradition established in 2010 at the first symposium, all those purchasing advanced reservations will also receive the limited-edition railroad print (ink on parchment) - “Over the Great Divide,” courtesy of Mel McFarland. Additional copies of the print, and prints from past symposiums, as well as other railroad-oriented items will also be available for purchase. The John Wesley Ranch, operated by the First United Methodist Church in Colorado Springs, has graciously opened their historic lodge facilities to host the symposium again. The ranch is located south of Divide at 21285 Highway 67 just before the entrance to Mueller State Park, and just a few yards from the old Midland Terminal railroad grade. Ample parking is available. Directions from Colorado Springs: Take U.S. 24 west up Ute Pass from Colorado Springs for 25 miles through Woodland Park to the town of Divide, turning left on Highway 67 South. The entrance to the John Wesley Ranch is 3 miles from the intersection on the right. The Teller Historic and Environmental Coalition, Inc. is a 501(c)3 nonprofit Colorado corporation formed in 2000 (EIN 84-1552939). T.H.E. Coalition’s mission is to facilitate preservation of the historic, environmental, recreational and scenic resources in and around Teller County, and to broaden public understanding regarding the significance of those resources. The Divide Chamber of Commerce, a partner of T.H.E. Coalition, is a 501(c)6 non-profit corporation supporting local businesses in the Divide community. 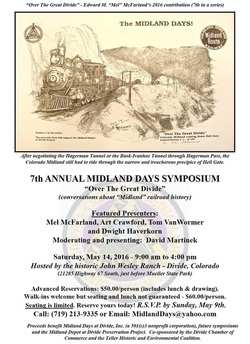 All proceeds and contributions (less meal costs) from the “2015 Midland Days” symposium will help support Midland Days at Divide, Inc. and future symposiums, as well as the Midland Depot at Divide Preservation Project and its partnering organizations. Note: The cost of attendance may be paid in advance by mail (c/o Midland Days, P.O. Box 1088, Divide, CO 80814) or upon arrival (checks – to “Midland Days” – cash or credit card please).